This 2018 NBA draft Thursday could debut as a suspense thriller movie. Rarely in recent years — and perhaps for the Bulls in the last two decades — has there been a draft as deep in talent, at least theoretically, with as much uncertainty and as many questions about players and status. 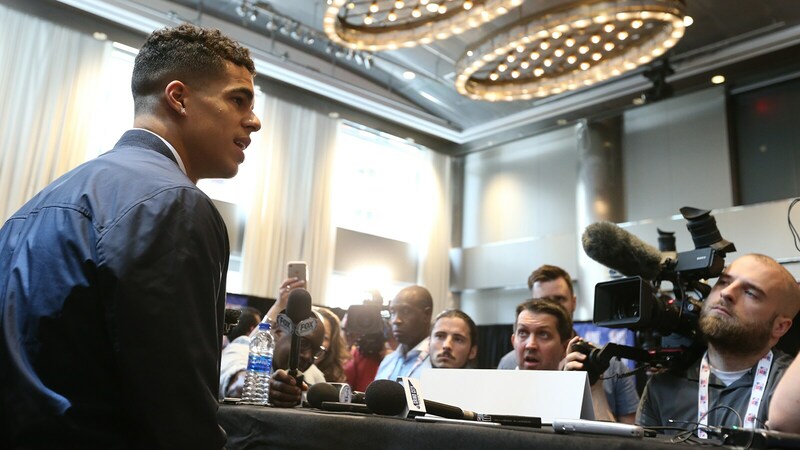 Is Michael Porter Jr. a potential superstar and MVP candidate or a bad back waiting to spasm. Is Trae Young, the most famous and productive player in college last season, Stephen Curry or Bryce Drew? How is Jaren Jackson Jr. considered by many to be the top player from this draft in five years and plays just half the game in one of the weakest conferences? Is Luka Doncic from Slovenia a better version of Toni Kukoc or a poorer version of Jiri Welsch? 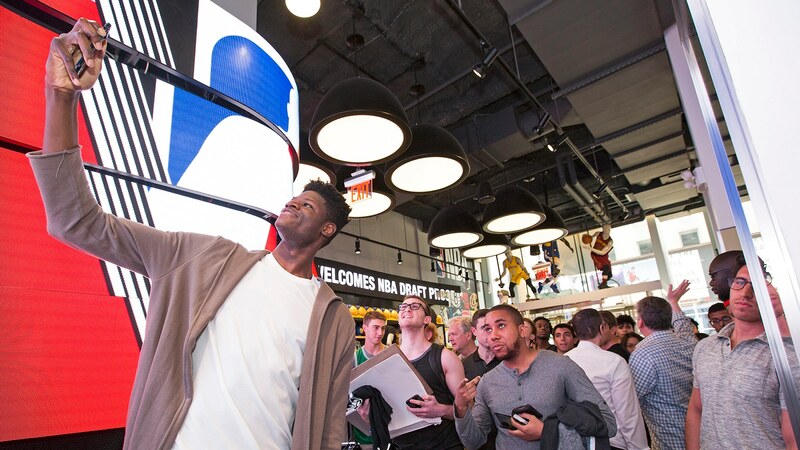 Is Mohamed Bamba taking Rudy Gobert to school or capable of being schooled by Yinka Dare? What also makes this draft unusual is the uncertainty among NBA executives. 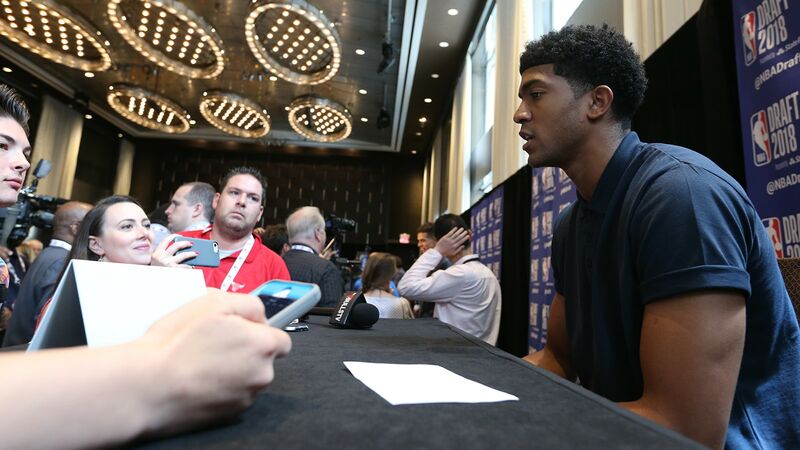 Last year, for example, there was considered consensus and most of the mock drafts even from media and fans were similar and held true, except, of course, for surprise rookie Donovan Mitchell. This year top players have been identified as high as Nos. 2 and 3 and the same players as low as the bottom of the lottery. Similarly for the Bulls with the No. 7 selection, they’ve been linked to perhaps a half dozen players, including Young, Porter, Jackson, and Bamba as well as Mikal Bridges, Wendell Carter Jr. and Collin Sexton. There have been multiple reports the Bulls have been actively attempting to trade ahead in the draft, though it’s been unclear for whom, assuming they could. The Atlanta Hawks at No. 3 need players in a total rebuild and are said to like Young as a replacement for Dennis Schroder. If Young were available at No. 7 would the Hawks take No. 22 and a reserve player from the Bulls in exchange? The Memphis Grizzlies at No. 4 supposedly are trying to drop the salary of injured Chandler Parsons. Would they take No. 22 and a player or two for No. 4 and Parsons? And then there’s the Bulls’ apparent interests. Executive-Vice President of Basketball Operations John Paxson identified a wing, small forward type player as a priority. But there’s also a need for a big man and someone who could score and pass like Young. Though after a 27-win season, it’s not like anyone is guaranteed a long term contract. There hasn’t been as much uncertainty for the Bulls with top picks since perhaps 1989 when with No. 6 from trade they opted for Stacey King and then took B.J. Armstrong with No. 18 and Jeff Sanders with No. 20. Derrick Rose in 2008 was a reasonably certain choice. The 2004 draft when the Bulls took Ben Gordon at No. 3 and Luol Deng at No. 7 didn’t have great talent after top pick Dwight Howard. Though some believed Emeka Okafor would be No. 1. The 2003 draft with LeBron James and Carmelo Anthony was loaded. The Bulls recovered after losing out on Dwyane Wade to draft Kirk Hinrich at No. 7. The 2001 draft was an outlier with the high school players, the Bulls believing they were on a championship reset with Tyson Chandler (draft rights acquired for Elton Brand) and Eddy Curry. Kwame Brown was the No. 1 choice. It wasn’t a strong draft, much like 2000 when the Bulls had Nos. 4 and 7, but could only come up with Marcus Fizer and then a swap for Jamal Crawford. No. 1 was Kenyon Martin, but No. 2 Stromile Swift and No. 3 Darius Miles. Most expect a more significant level of talent to reach No. 7 in this draft, though whom it will be likely will remain a mystery until Thursday night. There’s little doubt U. of Arizona center DeAndre Ayton will be the No. 1 choice for the Phoenix Suns. Then comes the suspense. It should be a great show. 1. 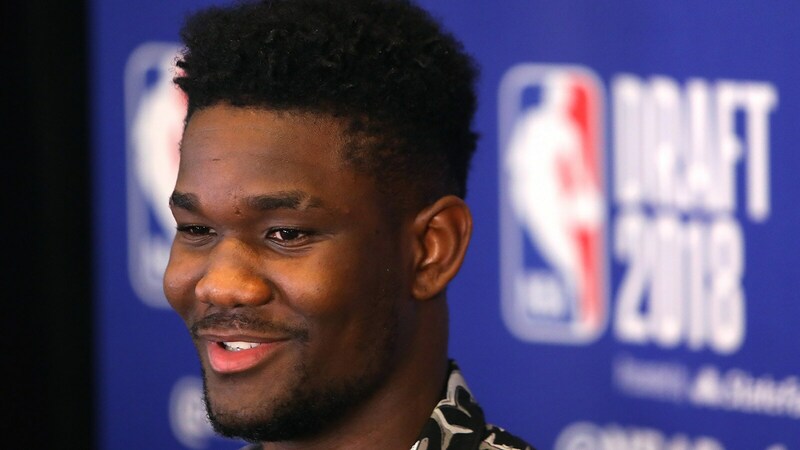 Phoenix Suns: DeAndre Ayton, C, Arizona, 7-1, 260. Is he Joel Embiid with better feet? The Suns might even take Embiid’s early career issues if Ayton proves similar. He’s said to be the consensus best player in this draft with the all around abilities of this era’s big man. Phoenix used to be an NBA destination and he could help make it one again. 2. Sacramento Kings: Marvin Bagley III, F, Duke, 6-10, 235. Most assume the Kings will mess this up like they often do, but Bagley looks like the other sure shot for this draft. Others could emerge that way, but his unique explosiveness, hard work and commitment seems to make him an obvious choice. Except to the Kings, who were rumored to have interest in Michael Porter Jr.? Bagley should be the replacement for DeMarcus Cousins without the excesses. 3. Atlanta Hawks: Jaren Jackson Jr., C, Michigan State, 6-11, 235. There’s perhaps a chance to trade down here because of their vast personnel needs. Or would they take Doncic given the need for potential starring talent? Porter Jr.? Young? 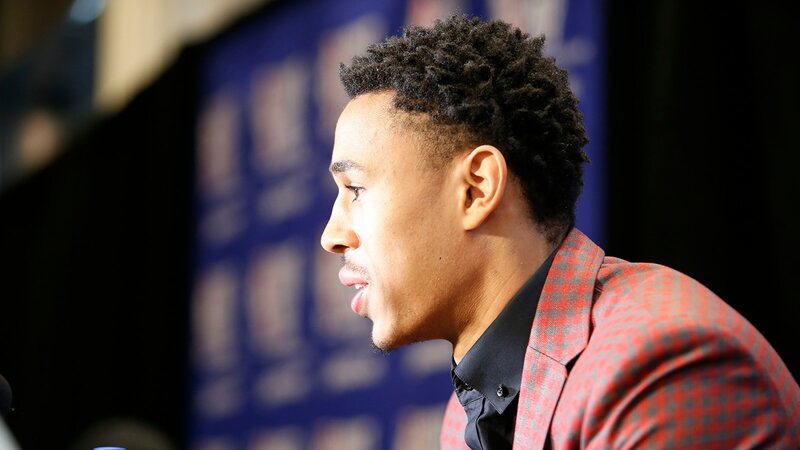 There were some Young rumors, but with talented John Collins last year and now taking Jackson Jr., the thinking is a developing front line core. 4. Memphis Grizzlies: Luka Doncic, G, Real Madrid, 6-8, 220. Time to rock and roll? Doncic has been promoted often, sometimes even as the No. 1 talent in this draft for his superb play in Europe, outplaying veteran players as a teenager with a wide range of skills. Though there’s often a chauvinistic pause with American NBA execs about the international competition. The Grizzlies are stuck with a huge payroll and declining attendance. They’re the most mentioned for a trade down for financial relief and perhaps the notion that the main talent is with the first three bigs in this draft. 5. Dallas Mavericks: Mohamed Bamba, C, Texas, 7-1, 225. There’s been speculation that the Mavericks might gamble on Porter Jr. for the chance at a more versatile potential star with Dirk Nowitzki really, no really, playing his final season. Dirk was a risk in the 1998 draft, taken ninth and still considered too high. But the Mavs have been center poor for decades. James Donaldson and Shawn Bradley are considered among their best. Tyson Chandler may be their best and he couldn’t shoot. Bamba schooled in Texas, so they know him. 6. Orlando Magic: Trae Young, PG, Oklahoma, 6-1, 180. Someone needs to get to the point there. They traded Elfrid Payton last season and he wasn’t that good, anyway. They were closing with D.J. Augustin. They’re starting again yet again, and they do have some front court talent. The buzz has been they’ve pushed Collin Sexton ahead of Young. But attendance has collapsed with years of missed playoffs and Young can be an exciting talent. Plus he involves others more than Sexton. Orlando needs some flash more than nasty. 7. Bulls: Wendell Carter, C, Duke, 6-10, 250. Not bad, not bad at all. The Bulls likely have been rooting around with eyes higher in the draft, but Carter Jr. should do just fine. He plays hard, can shoot with range and cover defensively outside, is unselfish and physical. He’s on the shorter side for the typical big man, but hardly anyone uses those big men to score. Half Embiid shots come from outside. 8. Cleveland Cavaliers: Shai Gilgeous-Alexander, PG, Kentucky, 6-6, 180. Now LeBron will stay? You have to assume LeBron staying is about the same as the odds of hitting it big in the owner’s casino downtown Cleveland. So move ahead. Many will scream for Porter Jr., and many have speculated he’ll go here. But Shai is a smooth lead guard type who is smart and skilled and a good start over. 9. New York Knicks: Miles Bridges, F, Michigan State, 6-7, 220. You know they’ll be booing this one in New York and screaming they got the wrong Bridges and they’ve got one that goes to Brooklyn for him. Hey, buddy, want to buy a Bridge? Some do like him more than Mikal for his all around play and shooting, a tough, physical, versatile player for this NBA’s position less game. 10. Philadelphia 76ers: Mikal Bridges, SF, Villanova, 6-7, 210. He’s their man, a local guy from Villanova who fits playing off Embiid and Ben Simmons with catch and shoot abilities as well as good team defense. He’s a little on the slim side, but mature with the two-time NCAA champions. 11. Charlotte Hornets: Collin Sexton, PG, Alabama, 6-1, 185. Buy, bye Kemba? Perhaps by the time you are reading this? The Hornets have been more anxious to shed money than add talent, at least for now. It’s a new management staff and coaching, and Sexton is the sort of tough, no nonsense competitor who would appeal to owner Jordan. He’s small, but so was Kemba, so they’re accustomed to that. 12. Los Angeles Clippers: Michael Porter Jr., SF, Missouri, 6-10, 220. He can run on the beach and the sun could make his back feel better. With two lottery picks and a decimated roster after the departures of Blake Griffin and Chris Paul, and little likelihood for a star at the end of the lottery why not take a chance? Advisor Jerry West always thinks big. 13. Los Angeles Clippers: Jerome Robinson, G, Boston College, 6-5, 190. He’s become maybe the highest riser in this draft since earlier in the season. Pretty much no one had him as a first rounder before the season. Big time potential shooter and scorer. 14. Denver Nuggets: Kevin Knox, F, Kentucky, 6-9, 215. Fits their profile with another languid athlete who’ll get out on the break and run. Not exactly a shot creator, though very young in not even turning 19 until later this summer. 15. Washington Wizards: Robert Williams, C, Texas A&M, 6-9, 240. Some executives say he’s maybe the best athlete in this draft, though occasionally indifferent or distracted and suspended once. They seem to be ready to move on from Marcin Gortat and perhaps an athlete to work with John Wall. 16. Phoenix Suns: Aaron Holiday, PG, UCLA, 6-1, 185. They’ll have a lot of young guys now, and still really don’t have a point guard. He’s small, the brother of NBAers Justin and True, a speedy, penetrating player who will find teammates. The Suns finally may be fun to watch again. It’s the way they played for 40 years until the last decade. 17. Milwaukee Bucks: Zhaire Smith, SG, Texas Tech, 6-4, 200. A tough all around player, a defender with a capable shot. He’s a player who can run the wing with Giannis and enhance their roster with another long, athletic player. 18. San Antonio Spurs: Donte DiVincenzo, G, Villanova, 6-4, 200. Another player who moved up in the rankings, being an NCAA championship hero helping. He’s more than a fluke, athletic and a good shooter even though he wasn’t a starter. 19. 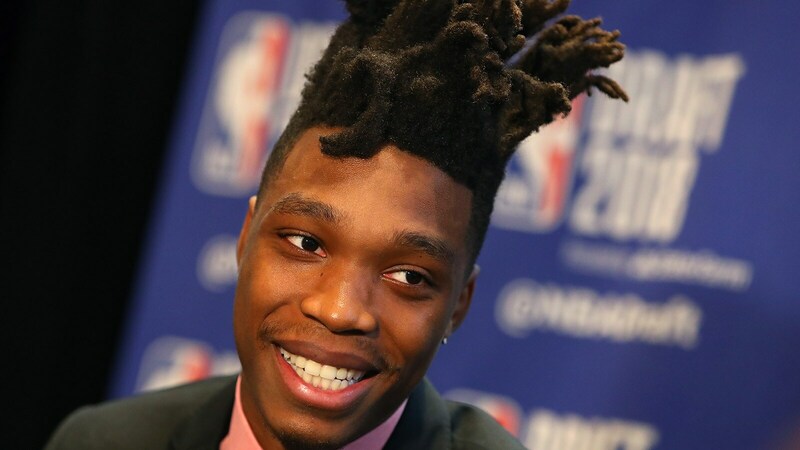 Atlanta Hawks: Lonnie Walker, SG, Miami, 6-4, 195. A slashing, scoring type who has good size for defense. They’re a team building up inventory as some regard him as a high level, developing prospect. 20. Minnesota Timberwolves: Kevin Huerter, SG, Maryland, 6-7, 195. Perhaps the best shooter in the draft, though more catch and shoot variety. The way they play with Jimmy Butler and Karl-Anthony Towns they could use a court spreader. 21. Utah Jazz: Troy Brown, SF, Oregon, 6-7, 210. It’s the shooting guard section of the draft and he is good all around. Has played point guard and fits their all around personnel with a capable shot. 22. 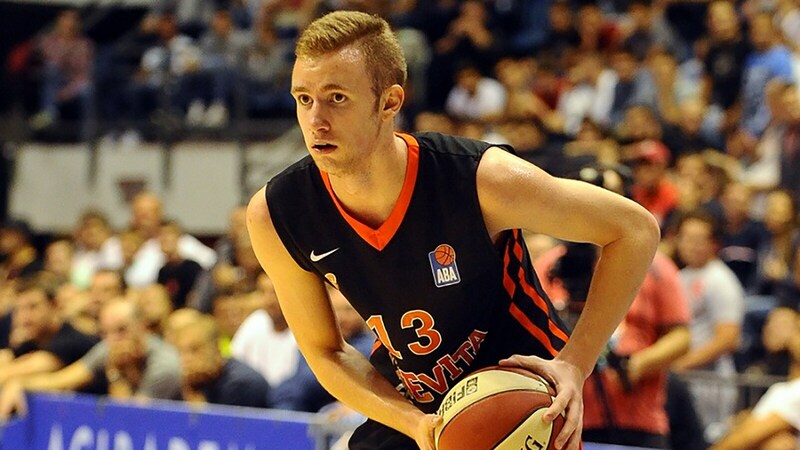 Bulls: Dzanan Musa, F, Bihac, Bosnia & Herzegovina, 6-9, 195. The Chandler Hutchison of Europe? Growing weary of putting him in the Bulls spot. Some say Musa in Eastern Europe translates to Hutchison. I know everyone expects the Bulls to select Hutchison, and perhaps they will. But at No. 22, it’s worth it to take a chance. So I’ll do it with my mock draft, too. After all, the bottom third is all about seeing who falls and taking a chance. Musa is the needed wing player, but also bold with an aggressive nature, a good shooter and all around player who’s forceful and a scorer. 23. Indiana Pacers: De'Anthony Melton, G, USC, 6-4, 190. Versatile scoring guard who is aggressive and athletic and can begin to become a nice tandem with Victor Oladipo. Can handle the ball and finish. 24. Portland Trailblazers: Elie Okobo, PG, 6-2, 180. Left handed point guard from the Left Bank (France). 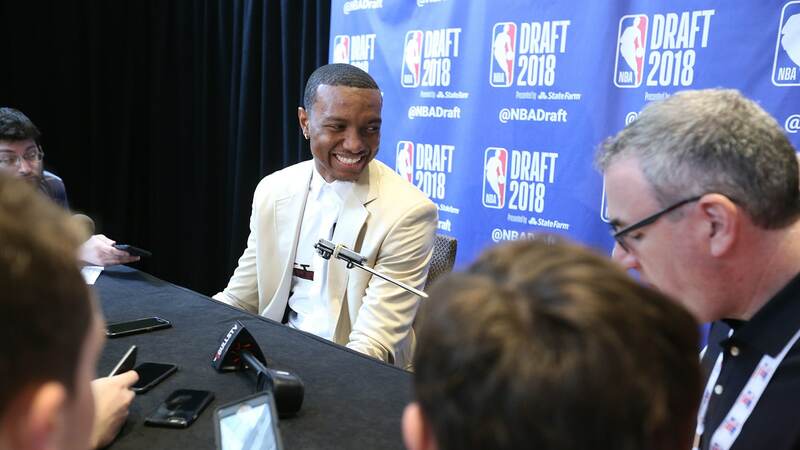 Not necessarily a replacement for Damian Lillard, but if they break up their backcourt to make a move and add some interior strength, as some have speculated, Lillard could move off the ball with Okobo a scorer and facilitator. 25. Los Angeles Lakers: Josh Okogie, SG, Georgia Tech, 6-4, 210. An aggressive and explosive athlete who can shoot some, so he can play off LeBron? OK, we don’t quite know that yet, but he’s another interesting talent to go with a nice group of young players. 26. Philadelphia 76ers: Keita Bates-Diop, F, Ohio State, 6-8, 225. Good, all around wing player with shooting ability to fit in and perhaps eventually replace the popular Covington in their developing young group. 27. Boston Celtics: Chandler Hutchison, SF, Boise State, 6-7, 200. So it turns out the Celtics gave him the promise, eh? He was the guy slated to the Bulls for a month, and perhaps still. Good all around wing player, smart and solid. 28. Golden State Warriors: Moritz Wagner, C, Michigan, 6-11, 240. Versatile, good shooting big man. Yes, another shooter! Runs the floor and can pick and pop and they always need someone inside to fill in. 29. Brooklyn Nets: Jalen Brunson, PG, Villanova, 6-2, 200. They seem ready to move on from Jeremy Lin before too long. Brunson is one of those players who is always undervalued, but he knows how to win and make plays. Not the fastest or most athletic, but will make shots and make plays. 30. Atlanta Hawks: Bruce Brown, G, Miami, 6-5, 200. With multiple picks, why not? He has been a highly valued prospect before a stress fracture knocked him out this season. Exceptionally strong, physical player and top athlete.